TUSQ Acoustic Guitar Saddle - Non-Compensated Martin 3/32" Ivory Ivory. If you have a high quality acoustic or vintage guitar, you owe it to yourself to hear the difference a TUSQ saddle will make. Compared to standard materials, you'll hear crystal clear bell-like high end, big open lows, and a noticeable increase in overall sustain. TUSQ saddles are designed to transfer the right frequencies more efficiently from the string to the guitar body, and have been proven to increase a guitar's harmonic sustain. Hear your acoustic guitar come alive with delicate highs and big open lows! TUSQ is far superior in sound and appearance to synthetics such as Micarta and Corian. The high levels of heat and pressure used in making TUSQ results in its exotic ivory-like appearance. Join those who know great guitar tone! TUSQ is used by: Martin, Taylor, Larrivee, Gibson Acoustic Guitars, Tacoma Guitars, Ovation, Rick Turner, Garrison Guitars, Breedlove, Manuel Rodriguez, Rainsong, Carvin, Landola and many, many more. TUSQ has quickly become an important tone performance tool for many guitar manufacturers, luthiers and playing professionals around the world. 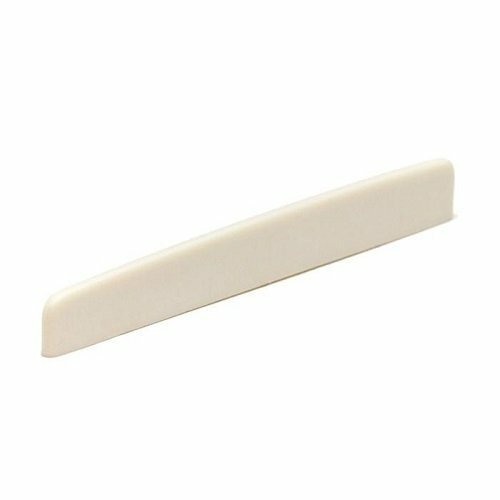 Bone and ivory have hard and soft spots (grain), throughout each piece, hampering consistent transfer of vibrations to the guitar top. TUSQ nuts have rich tone and sustain, without the inconsistency found in ivory, bone and other natural materials.